Wishes and Dreams--It's All About FIBER! : My First 3-ply Yarn! My first skein of 3-ply yarn! Still not as perfect as I'd like, but I love it anyway! Plied, & wound onto the niddy noddy to be made into a skein of gorgeous yarn! This is a lazy-kate, a tensioning device used for plying. The bobbins, with the singles evenly divided between 3 bobbins, ready to be 3-plied. 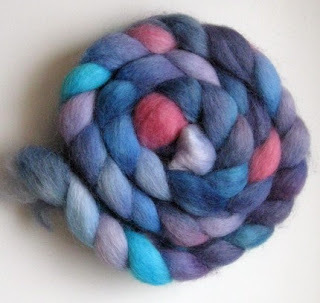 This is a Romney roving, hand dyed by SheepishCreations.etsy.com. I decided to try my hand at 3-ply yarn, so we will see how that goes. The colors are so yummy, it will be interesting to see how they work out. The yarn looks a bit over-tw isted on the bobbin, I'm hoping it will work out though. Your yarn is beautiful!! Congrats on doing your first 3 ply. I am in the process of spinning my first 3 ply also for the Oatmeal sweater. My color is a light brown.